These tips for family portrait pose ideas are simple to use and will make a huge difference in your posing technique. 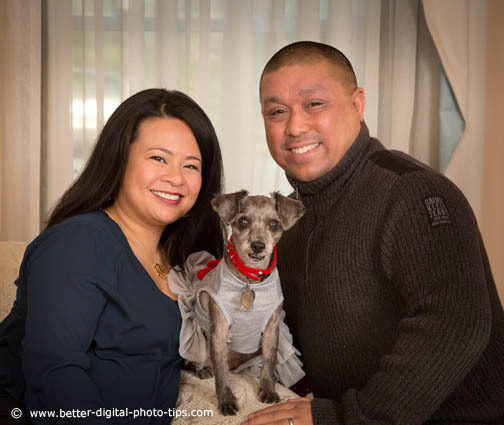 Even if you are not a professional portrait photographer, you can use them for a group shot at a family event or while taking vacation photos. This good-looking couple and their small dog was a great situation for zooming in tight and bringing their heads close together. Why? Because having everybody's face at the same height in a photo is usually boring. sitting on a chair, bench or medium stool. Having shorter people standing in back and taller people standing behind and slightly to the side of them is another posing tip for you to use. 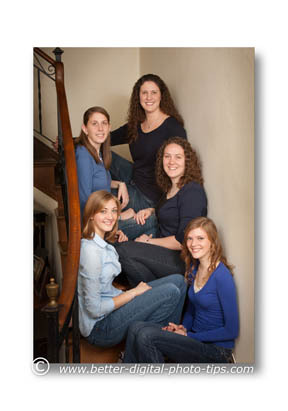 In this family portrait pose of the 5 cousins, everyone turned sideways and sat on different steps. I moved as far back as I could into the foyer to get a more distant perspective and stood on a stool so that I wasn't shooting up at them. Usually a 30 or 45 degree turn is best. Portrait photographers view it as a posing mistake to have subjects aimed directly at the camera. Turning partially sideways makes you appear thinner to the camera. Have your subjects turn their bodies slightly to the side. Then have them turn their heads back toward the camera. This makes more pleasing angles between their head and their shoulders. In a group pose, usually it's best to turn your subjects toward the middle of the group. Straight arms make a person look stiff and unattractive. Depending on the pose, you may have your subject hook their thumb in their belt loop or gently slide it into their pocket. Perhaps you could have them rest their hand on another person's shoulder, back or another object to cause a slight bend at the elbow. Just a slight tilt of the head toward the middle of the group makes a difference in your composition. It makes it just a little more intimate and adds a little visual interest. In this family pose of 4 people I also had the father and daughter lean their bodies toward the center. This also removes a little stiffness from the family portrait pose. You can take this a step farther for a real fun family pose. Take a really "fun one" after the formal poses. Get your family members to pose so that their heads are real close. Usually this results in some giggling or laughter and great natural smiles. It brings out the joy and happiness that family members share with each other. 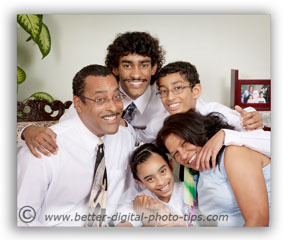 These family portrait pose ideas are photography tips that you can use when you are taking any kind of group photo. Family Portrait Tips. Other similar article on family portrait tips relating to outdoor family portraits. More Family Portrait Pose Ideas. 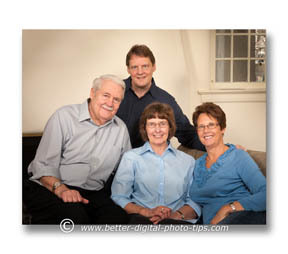 Group Photography-Portrait Tips for Posing. More ideas about group photography portrait poses. How to space your individuals within the group and use geometric shapes to improve your group photography. How to photograph people. This article gives some photography tips on photographing two kinds of people. They are people that you do know as well as people that you do not know with photo examples to illustrate the points covered. If you got any ideas from this article, could you share it with someone? Happy family portrait posing!